DDF Mattifying SPF15 review: Can You Really Trust This Product? DDF Mattifying Oil Control UV Moisturizer SPF 15 Review:Is It Good? 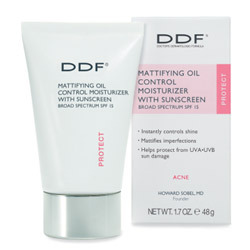 DDF Mattifying Oil Control UV Moisturizer SPF 15, US $39 for 1.7 oz., works to control oil and regulate blemishes to leave your skin with nothing less than a flawless surface and smooth overall complexion. Short for Doctor’s Dermatologic Formula, DDF was founded in 1991 by a New York dermatologist who, through this brand, promoted more skin care focus on antioxidants, oil control, and strengthening the skin’s protective barrier. Apply a generous amount of DDF Mattifying Oil Control UV Moisturizer SPF 15 on all exposed areas of your skin at least 15 minutes before stepping out into the open. Use this product under your makeup. This sunscreen is specifically formulated for people with oily and combination skin types. A DDF Mattifying SPF15 review by a user who claims to have an oily skin type cited that this sunscreen didn’t leave the user’s skin greasy like most other sunscreens normally would. This product is formulated with toxic chemical sunscreen actives that have been proven many times to have endocrine-disrupting effects that can cause irregularities in several vital body functions. This product contains retinyl palmitate which will breakdown easily as soon as exposed to heat and UV and therefore renders it useless in this formula. The formula contains several potentially irritating and skin damaging ingredients, such as alcohol, witch hazel, and retinyl palmitate. A DDF Mattifying SPF15 review has cited what many others have pointed out about this product, that is, it can be severely irritating to the skin. DDF Mattifying Oil Control UV Moisturizer SPF 15 is for when your skin needs a sheer and lightweight formula that won’t leave your skin greasy. There are several facts about this formula, however, most especially that it has drying alcohols and misplaced anti-aging Vitamin A, which deserve a red flag.